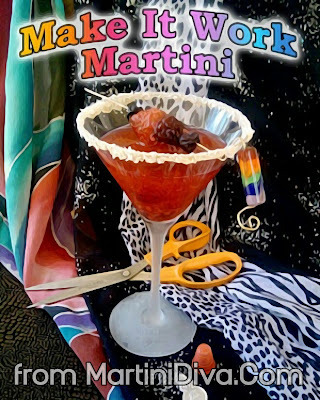 THE PROJECT RUNWAY MARTINI - MAKE IT WORK! Dip your martini glass in the agave syrup and then into the Shimmer White Sugar Crystals and chill in the freezer. Put the cup of mixed berries and the lemon juice into the bottom of a cocktail shaker and muddle really well so all the juices are released. Add a cup of ice to your cocktail shaker, pour in the Loopy Vodka and shake until well chilled. Your cocktail shaker will frost over when the martini is chilled well. Strain this into your chilled martini glass, skewer the berries onto your fashion forward cocktail pick, lay this across the martini and enjoy during every episode of Project Runway. If you need a snack to go with try my Salad Pizza!